The Brazilian footballer was a regular for United during pre-season but he has since struggled for gametime regardless of the change in manager at the helm. Due to this, he has been linked with a potential loan move away from the Red Devils but Ole has stressed that may not be the case with the midfielder likely to earn playing time in the final months of the season. "I can't see him going out on loan. Andreas has done fantastic in training ever since I've come back," he said. "He's a player that you could see playing quite a few games for us towards the end of the season." 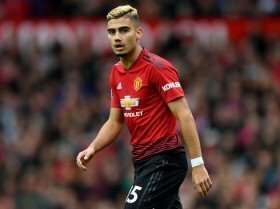 Pereira has earned just 17 minutes of league action since Ole took over the reigns last month but he has made a solitary start against Reading in the FA Cup third round.